Derrick Johnson is working his way back from a torn Achilles tendon. KANSAS CITY, Mo. 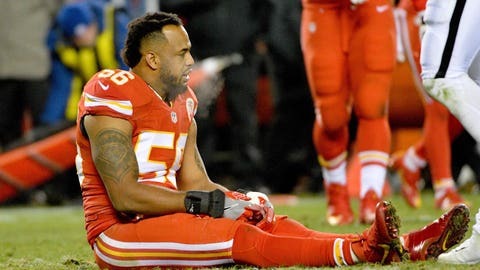 — Chiefs linebacker Derrick Johnson expects to be back by training camp after tearing his Achilles tendon late last year and missing the end of the regular season and playoffs. The four-time Pro Bowl linebacker ruptured his right Achilles tendon in a game against Oakland. It was the opposite tendon from the one he tore in 2014, missing almost the entire season. Johnson said that rehab has been going well and he expects to be “100 percent” when the Chiefs convene at Missouri Western for training camp in late July. But he doesn’t want to put a date on his return, and it’s possible he’ll miss the entire offseason program that began Monday. Johnson signed a three-year, $21 million contract prior to last season but agreed to rework the deal this offseason to give the Chiefs some much-needed salary cap space. But the 34-year-old is still signed through next season, and he has every intention of playing out the deal. His performance last season certainly wasn’t diminished. He made 90 tackles and returned a pick for a touchdown despite playing only parts of 13 games before his injury. Chiefs coach Andy Reid was even more optimistic than Johnson, saying there is a chance he could participate in some work when the team holds its mandatory mini-camp in mid-June. In other injury news, Reid said defensive end Allen Bailey is almost ready to go after landing on injured reserve with a shoulder injury in October, and fellow defensive lineman Jaye Howard has been rehabbing in Florida after having surgery on his hip. Offensive lineman Parker Ehinger is still rehabbing after surgery last fall on his right knee, linebacker Dadi Nicolas is likewise working back from a knee injury, and backup running back Darrin Reaves had sports hernia surgery recently. Reid declined to say how many players showed up for the first day of voluntary workouts — “That puts their names out there,” he said — but he did acknowledge most players were in attendance. Players will mostly work out and spend time in the classroom until OTAs begin May 23.